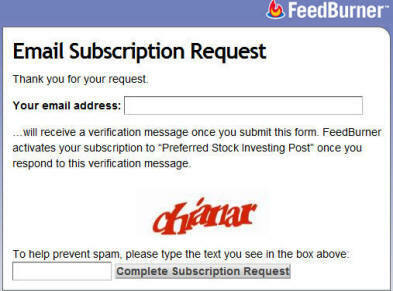 - from Jeff S., CDx3 Notification Service subscriber. See more preferred stock investor reviews here. 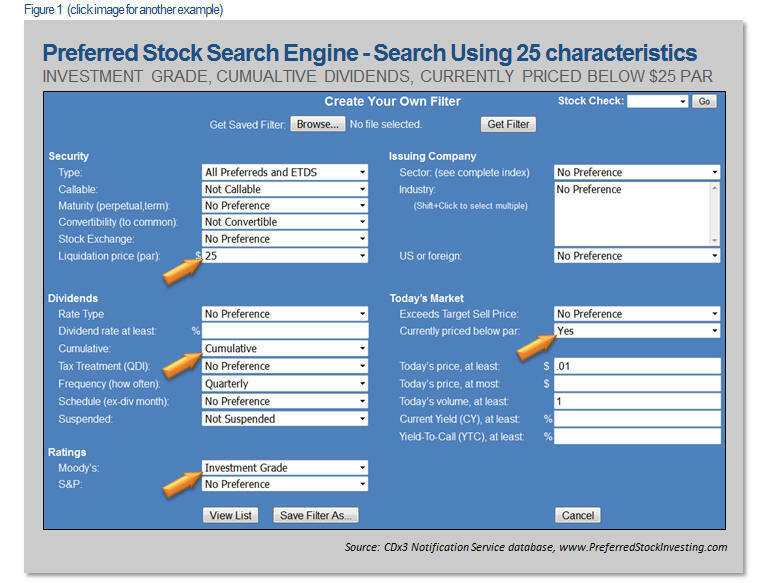 There are currently 123 high quality preferred stocks selling for an average price of $24.38 per share (investment grade, cumulative dividends). 39 of these high quality issues are now selling below their $25 par value, offering an average current yield of 5.5 percent. There were a total of 905 preferred stocks and ETDs trading on U.S. stock exchanges as the month came to a close (including convertible preferred stocks). Of these 905, these are the top ten highest quality issues that are trading below their $25 par value. This list is sorted by dividend rate (coupon) with the highest payers listed first. 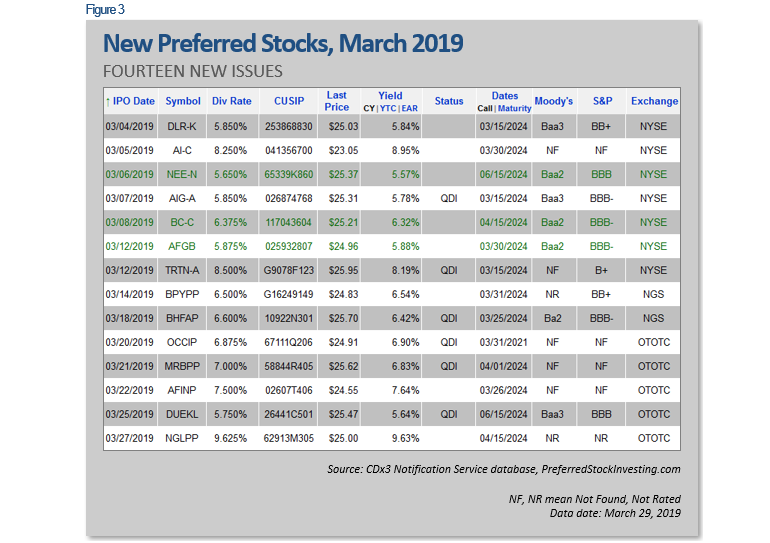 March delivered a spectacular crop of new preferred stock issues, almost all of which are offering cumulative dividends and half come with investment grade ratings. Last December no new preferreds were issued; for January I described only four new preferreds while February’s preferred stock market delivered a slightly better six new issues. During March, fourteen new preferred stocks were issued (and began trading by press time). 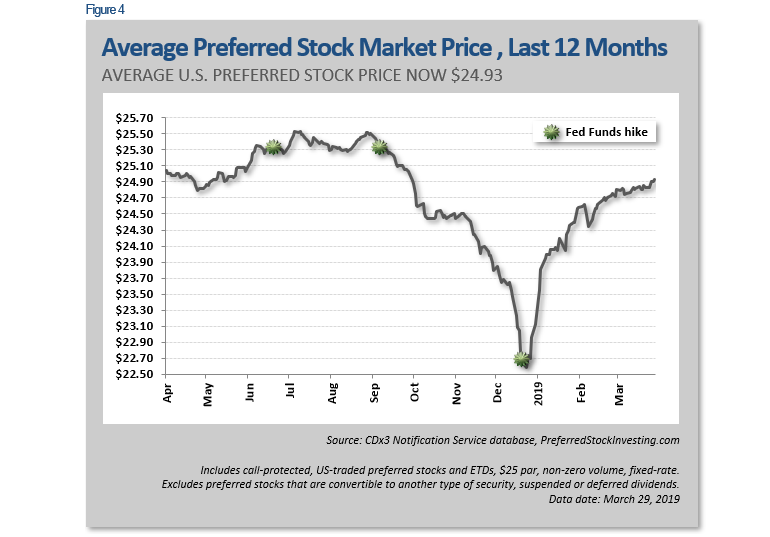 As the month came to a close, the average market price for all U.S. traded preferred stocks was $24.93, up $0.21 per share over the last month. The good news is that $24.93 is still below these securities’ $25.00 par value. Remember that the par value is what shareholders will receive in cash should the issuing company decide to redeem your shares so buying shares below par sets you up for a downstream capital gain on top of the regular dividend income provided by these securities. March’s fourteen new preferred stocks are offering an average annual dividend (coupon) of 6.9 percent, an average current yield (which does not consider reinvested dividends or capital gain/loss) of 6.9 percent and an average Yield-To-Call (which does consider reinvested dividends and capital gain/loss) of 6.8 percent (using March 29 prices). 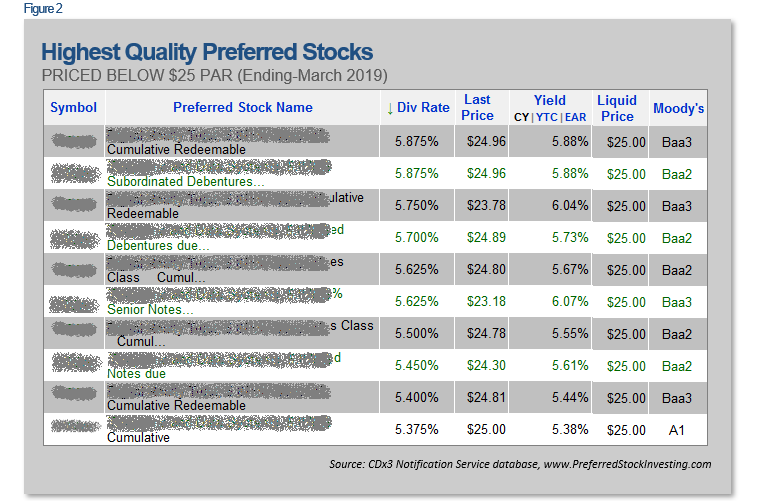 There are currently 123 high quality preferred stocks selling for an average price of $24.38 (March 29), offering an average current yield of 5.5 percent. And 39 of these high-quality issues are selling below their $25 par value, offering an average current yield of 5.5 percent. By high quality I mean preferreds offering the characteristics that most risk-averse preferred stock investors favor such as investment grade ratings and cumulative dividends. There is now a total of 905 of these securities trading on U.S. stock exchanges (including convertible preferred stocks). Note that OCCIP from OFS Credit Company (OCCI), MRBPP from Merchants Bancorp (MBIN), AFINP from American Finance Trust (AFIN), DUEKL from Duke Energy (DUK) and NGLPP from NGL Energy Partners LP (NGL) are still trading on the wholesale Over-The-Counter exchange. OTC trading symbols are typically temporary until these securities move to their retail exchange, at which time they will receive their permanent symbols. Your broker will automatically update the trading symbols of any shares you purchase on the OTC. OCCIP will keep this symbol as it moves to the NCM, MRBPP will become MBINP, AFINP will keep this symbol, DUEKL’s new NYSE symbol has yet to be specified and NGLPP will become NGL-C.
DLR-K is a traditional preferred stock offered by Digital Realty (DLR) with an investment grade rating from Moody’s Investors Service. DLR has six preferred stocks trading on U.S. stock exchanges, although it is using the $200 million proceeds from DLR-K (5.850 percent) plus cash on hand to redeem all outstanding shares of DLR-H (7.375 percent) on April 1, saving the company about $3 million per year in dividend expense. DLR is incorporated as a property REIT specializing in data centers with properties throughout North America, Europe, Asia and Australia. With cloud and mobile computing demand pushing expansion, the company has announced a joint venture with Mitsubishi, purchasing a five-acre parcel in Tokyo upon which it will build a new data center hub. DLR-K pays cumulative dividends. NEE-N is offered by NextEra Capital Holdings (NEE), the latest of the company’s five income securities that are currently trading on U.S. stock exchanges. NEE-N is a double-investment grade Exchange-Traded Debt Security offering a 5.650 percent coupon (green font in the above table). ETDS’ are bonds recorded on the company’s books as debt (rather than as equity, as in the case of preferred stock). As debt, the obligation to pay the interest on these bonds is cumulative. As bonds, ETDS’ are often seen as having lower risk than the same company’s preferred stock shares. ETDS are very similar to preferred stocks and may be listed on brokerage statements as such. NEE generates and distributes 24,500 megawatts of electricity throughout North America. The $582 million proceeds from NEE-N are expected to be used to reduce debt, including the outstanding obligation from its purchase of Gulf Power on January 1, 2019 (due June 25, 2019). The company was founded in 1925 and is headquartered in Juno, Florida. Global insurer American International Group (AIG) re-entered the preferred stock market during March with the introduction of AIG-A, a double-investment grade traditional preferred stock. AIG-A offers a cumulative 5.85 percent annual dividend. “Cumulative” dividends are those that can be deferred but not suspended. Put another way, if the company misses a dividend payment they still owe you the money (their obligation to you accumulates). AIG is a $38 billion insurer founded in 1919 and headquartered in New York City. BC-C is a 6.375 percent ETDS from Brunswick Corporation (BC) offering double-investment grade ratings. The next time you’re hauling in a bass from a Boston Whaler or jumping a double wake behind a Bayliner with a big Mercury outboard, thank Brunswick. Or while you are telling exaggerated stories of your greatness over a game of pool, don’t forget to notice that the table is almost certainly made by this company. BC is the Procter and Gamble of recreational products; there’s very little outdoor or indoor fun you can have without coming into contact with something they make. Brunswick has three income securities trading, all of which were introduced within the last six months. Established in 1824, this $5.1 billion company is headquartered in Mettawa, Illinois. AFGB is from property and casualty insurer American Financial Group (AFG). As an ETDS offering double-investment grade ratings and cumulative interest, this security is very similar to Brunswick’s BC-C. The most obvious difference is in AFGB’s miserly 5.875 percent interest rate, compared to BC-C’s 6.375 percent. AFGB is the third income security that AFG has introduced within the last five years. AFG is a $8.7 billion company founded in 1872 and headquartered in Cincinnati. TRTN-A is offered by Triton International Ltd. (TRTN), the world’s largest lessor of shipping containers and chassis. Coming off of a multi-year container glut, Triton posted a 25 percent profit margin on December 30, 2018 and managed to beat analysts EPS estimates every quarter last year. While the company’s operating performance is enviable, its whopping $7.5 billion long-term debt probably explains in large measure the meager B+ rating from S&P. During March the company executed a common share buyback, whereby all 7.1 million shares held by Warburg Pincus LLC were sold to underwriter Morgan Stanley, with Triton then buying 1.5 million of these shares from MS. TRTN’s common stock has lost about 10 percent of its value since March 1. This indirect buyback burned about $45 million of the $75 million generated by the TRTN-A preferred stock introduction. TRTN-A is the company’s first and only income security. TRTN is a $2.4 billion company founded in 1980 with headquarters in Bermuda. BPYPP is from Brookfield Property Partners LP (BPY) offering 6.5 percent cumulative dividends and a BB+ speculative grade rating from S&P. This issuer is a partnership so holders of their preferred stock units will receive at least one K-1 at tax time (rather than form 1099). In February 2019, BPY announced its intent to buy back up to $405 million of its LP units (analogous to common stock) from unitholders. This offer expired on March 25, 2019. While the BPYPP prospectus does not specify how the company will use the proceeds from this preferred stock introduction, the $184 million coming from this new income security would presumably go toward the unit buyback, should the offer be taken up by unitholders. BPY is a $17 billion commercial real estate company headquartered in Bermuda. BHFAP is an investment grade traditional preferred stock from life insurance company Brighthouse Financial (BHF). BHFAP pays a non-cumulative 6.6 percent dividend. 2018 was BHF’s first full year operating as an independent company after its separation from MetLife. Brighthouse became an independent company in 2017. By any measure, operating as an independent company has been good for Brighthouse. Throughout 2018 the company grew top line revenue from $1.8B in Q1 to $3.9B in Q4. Net income grew from a $67 million loss in Q1 to a $1.4 billion gain in Q4. And all while expanding cash on hand from $1.9 billion to $4.1 billion by year end. And this is after the company embarked on an aggressive common stock buy back throughout 2018, purchasing $105 million in shares last year and another $19 million during January 2019. BHF has no debt maturing prior to 2024. Oddly, in the face of this strong performance, the common has lost about 30 percent of its value over the last year. BHFAP is the company’s second income security introduced within the last six months. MRBPP/MBINP from Merchants Bancorp is an unrated traditional preferred stock paying non-cumulative 7.0 percent dividends using the fixed-to-float rate structure. The rate becomes variable on the security’s April 1, 2024 call date, using the three-month LIBOR plus 4.605 percent. Page S-14 of the prospectus explains how the floating rate will be calculated should the 3-month LIBOR become unavailable. Merchants is a $543 million regional bank headquartered in Indiana with 14 offices. MRBPP/MBINP is the company’s only income security, raising $50 million in gross proceeds. No specific use for the proceeds of this new security were provided by the company (“general corporate purposes”). Importantly, but perhaps coincidentally, MBIN has lost about a third of its value since last summer despite impressive financial performance and plenty of cash on hand. The bank was established in 1990. AFINP from American Financial Trust is an unrated traditional preferred stock paying cumulative 7.5 percent dividends. AFINP is the company’s only income security. AFIN is a $1.1 billion REIT focused on retail property acquisition and management. The company has an aggressive growth strategy, closing 130 property acquisition during 2018 with an average remaining lease period of over 15 years. The company also sold 19 properties in the fourth quarter of 2018, 14 of which were dogs (unleased). $15.5 million of the $46.4 million of proceeds from these 19 sales went to pay down debt. While top-line revenue growth has been impressive for several years, earnings have alluded the company, explaining at least in part the six month slide in the company’s stock price. Another drag is pending shareholder litigation against the company with complainants claiming that the company was less than forthcoming with material information related to its 2016 merger with American Realty Capital. AFIN is headquartered in New York City. Go big or stay home! DUEKL is from Duke Energy. While the company has two ETDS already trading, DUEKL is a double-investment grade traditional preferred stock offering 5.750 percent cumulative dividends. DUEKL is a temporary OTC exchange symbol; the prospectus does not specify what the permanent NYSE symbol will be, once assigned. DUEKL is one of the largest income securities issued since the financial crisis ten years ago, raising a whopping $1 billion for Duke. And this while centerfielder Mike Trout was able to convince the Los Angeles Angels to pay him $430 million and the Troutster did not even need to issue any type of income security (catch the ball, throw it to the cut-off man). It took an underwriting group of twenty-one investment bankers to come up with the cash to buy the 40 million DUEKL shares from Duke. Duke is a $66 billion regulated electric utility primarily serving the southeast and midwest United States. NGLPP/NGL-C from NGL Energy Partners, LP is an unrated 9.625 percent traditional preferred stock paying cumulative dividends. The 9.625 percent coupon rate will reset on the security’s April 15, 2024 call date to a variable value based on the then-current three-month LIBOR plus 7.384 percent. Prospectus page S-18 describes how the rate will be set in the event that the LIBOR rate becomes unavailable. NGL is a $1.7 billion partnership organized into crude oil logistics, water solutions, liquids, retail propane, and refined products and renewables businesses. As a partnership, NGLPP/NGL-C shareholders will receive a K-1 form at tax time, rather than a 1099. The company has struggled to post a profit for several years. Although Q4/2018 was solid, NGL’s $23 million in cash seems meager for a $1.7 billion business. NGL was founded in 1940 and is headquarter in Tulsa, Oklahoma. 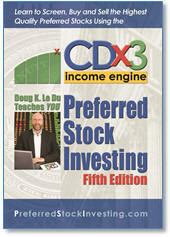 Sources: Preferred stock data - CDx3 Notification Service database, PreferredStockInvesting.com. Traditional preferred stock dividends paid by partnerships as pass-through income or are otherwise paid out of pre-tax profits are taxable as regular income; you pay the full tax since the company has not (BPYPP, NGLPP/NGL-C). Companies incorporated as REITs (DLR-K, AI-C, AFINP) are required to distribute at least 90 percent of their pre-tax profits to shareholders. Doing so in the form of non-voting preferred stock dividends is the most common method of complying and because these dividend payments are made from pre-tax dollars, taxable dividends received from REITs are taxed as regular income (i.e. they do not qualify for the special 15 percent dividend tax rate). Interest that a company pays to those loaning the company money is a business expense to the company (tax deductible), so the company does not pay tax on the interest payments it makes to its lenders (i.e. interest payments made to lenders are paid with pre-tax dollars). Since Exchange-Traded Debt Securities are debt, ETDS shareholders are on the hook for the taxes. Income received from ETDS’ is taxed as regular income (NEE-N, BC-C, AFGB). Lastly, if a company pays your preferred stock dividends out of its after-tax profits, the dividend income you receive is taxed at the special 15 percent tax rate. Such dividends are referred to as “Qualified Dividend Income” or QDI. QDI preferred stocks are often seen as favorable for holding in a non-retirement account due to the favorable 15 percent tax treatment. Looking at the Status column in the above table, the prospectuses for six of March’s new issues state that their dividends are QDI-qualified (AIG-A, TRTN-A, BHFAP, OCCIP, MRBPP/MBINP, DUEKL). 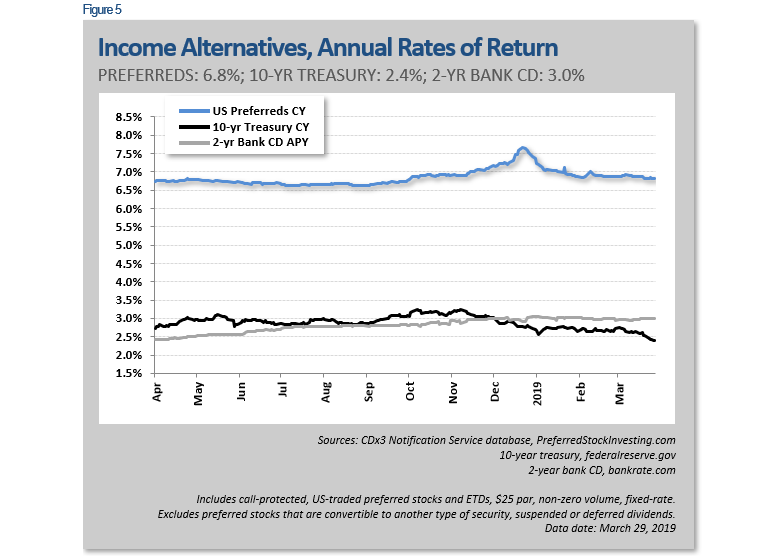 U.S.-traded preferred stocks are currently returning an average current yield of 6.8 percent (blue line) while the annual return being offered to income investors by the 10-year treasury is 2.4 percent and that of the 2-year bank CD has turned the yield curve upside down at 3.0 percent (shorter term money very rarely offers a higher return than longer term money). For comparison, I have set the Yield column in the first table above to show the current yield of the new March preferreds on March 29. It is into this marketplace that March’s new issues were introduced.